Upon arrival at Phnom Penh airport you will be met by your driver for private vehicle transfer to your hotel. You may like to take advantage of our fast track visa option and avoid the queues after a long flight. Once transported to the hotel you will be free to do as you please, relax and unwind. Overnight spent at the hotel. After breakfast you will have your first test ride from Phnom Penh to Sihanoukville. Sihanoukville is also known as Kampong Saom and is a province (khaet) on the gulf of Thailand. This port city is a growing urban center, located 185kms (115mi) southwest of the Cambodian capital, Phnom Penh. The province is named after King Father Norodom Sihanouk. Construction on the port of Sihanoukville began in June 1955 and is the only deep water port in Cambodia. The port was built in part due to the waning power of the French leading to the Vietnamese tightening their control over the Mekong Delta and hence restricting river access to Cambodia. The beautiful beaches and islands have made it a popular tourist destination. After the hotel check in feel free to explore the city. Hotel breakfast - Then ride from Sihanoukville along the coast to Kep. Kep is a coastal town 173kms from Phnom Penh and was previously a beach resort in the Kep province. Originally known as Kep-sur-mer, Kep was founded in 1908 during French colonial rule. The colonial influence is noticeable in the city's Provencal-style architecture and French cuisine.Unfortunately many of the French style villas have become run down and over grown but slowly the area is being redeveloped and tourism reemerging. On arrival at the hotel, check in and then time to explore. After breakfast we ride from Kep to Phnom Penh, passing Takeo province. On arrival in Phnom Penh , check in at the hotel. Then the afternoon is free time for visiting the national museum, the killing fields or other places of interest in Phnom Penh. Breakfast at the hotel before departing for Mondulkiri. The whole day will be spent riding along the Mekongs river bank offering beautiful landscapes and scenery. This is arguably one of Cambodias most beautiful areas and a perfect setting for a motor bike ride. 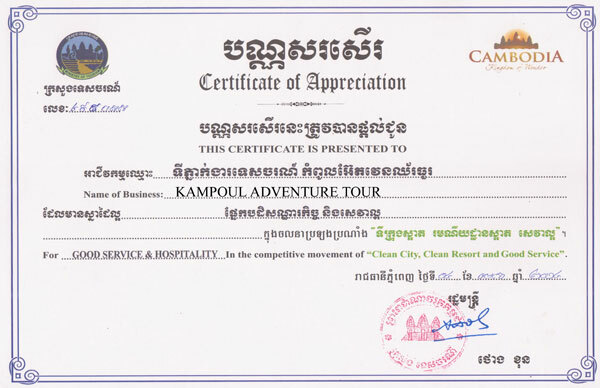 During the ride you will make a stop at the 3rd largest city in Cambodia known as Kampong Cham. Here you will enjoy seeing Nokor Wat a temple from the 11th century. Finishing the days ride once reaching Mondulkiri, checking in to the hotel and enjoying dinner at a local restaurant. 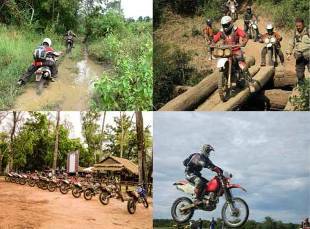 On the 7th day we ride north from Kratie to Stung Treng. In the morning we will ride 15 KM north to the river Kampi. Here we will take a boat to see the fresh water dolphins. Time allowing during the day we will visit Phnom Sombok, a pagoda on top of the mountain with a beautiful view of the Mekong. After that we will ride to Stung Treng. Stung Treng is located in the north-east of Cambodia near the border of Laos. Check in at the hotel and explore the city. After Breakfast the ride takes a westerly direction to Tbeng Meanchey and crossing the Mekong river by boat.Then there is a variety of roads to ride from nice big roads to small jungle trails passing through some beautiful scenery along the way. In the evening you will check into the hotel and see the sights of the city. After breakfast on the ninth day the ride heads north to Preah Vihea temple near the Thai border. In the afternoon the ride goes up a 525m high mountain to visit a 9th century Hindu temple built on top of the mountain. The temple was built in the reign of the Khmer empire and is a real highlight and not many tourist visit this area. After the temple visit the ride continues onto Sra Em village. Tonights stay will be at guest house. After breakfast we are leaving Sra Em heading south to Siem Reap. Lunch will be taken in Anlong Veng. Anlong Veng was till 1998 the headquarters of the Khmer Rouge and the last place of fighting. After lunch it's a ride up the mountain to visit the crematory place of Pol Pot, the hidden bunker of Pol Pot and the House from Darmok. In the afternoon the ride continues to Siem Reap where its check in time at the hotel. After breakfast we ride 50 KM through small villages and jungle to Phnom Kulen. Phnom Kulen has a major symbolic importance for Cambodians as the birthplace of the ancient Khmer Empire, for it was at Phnom Kulen that King Jayavarma II proclaimed independence from Java in 802 A.D.The site is known for its carvings representing fertility and its waters which hold special significance to Hindus. Just 5 cm under the water's surface over 1000 small carvings are etched into the sandstone riverbed. The waters are regarded as holy, given that Jayavarman II chose to bathe in the river, and had the river diverted so that the stone bed could be carved. A lotus flower protrudes from his navel bearing the god Brahma. The river then ends with a waterfall and a pool. After lunch we have a swim at the waterfall and visit a temple. In the afternoon we drive back to Siem Reap and finish the tour by having dinner at a local place with live music. After breakfast transfer from hotel to Siem Reap International Airport for journey back home. 7. Transport for the Motorbikes and gear to Phnom Penh (for starting the tour). 8. Mimimum age for rider is 18yrs old.